uuid : a9566990-d60b-4b50-a218-b48be9527d09 templates_id: 119572 templates_uuid: "ed4c16ec-1006-47b5-8368-0c39a1a46c40" title: "Flexible working application | Flexible working request" display_name: "Flexible working request" meta_keywords: "Flexible working application" description: "
Apply for flexible working with this flexible working request. Set out your proposed working pattern and suggest how the business can deal with any disruption as a result of your new working pattern. This application covers the requirements for a statutory request, when the new working pattern starts and an optional trial period for the new working pattern. What\'s a flexible working request? A flexible working request is the formal application made by an employee to request flexible working arrangements. Why do I need a flexible working application? 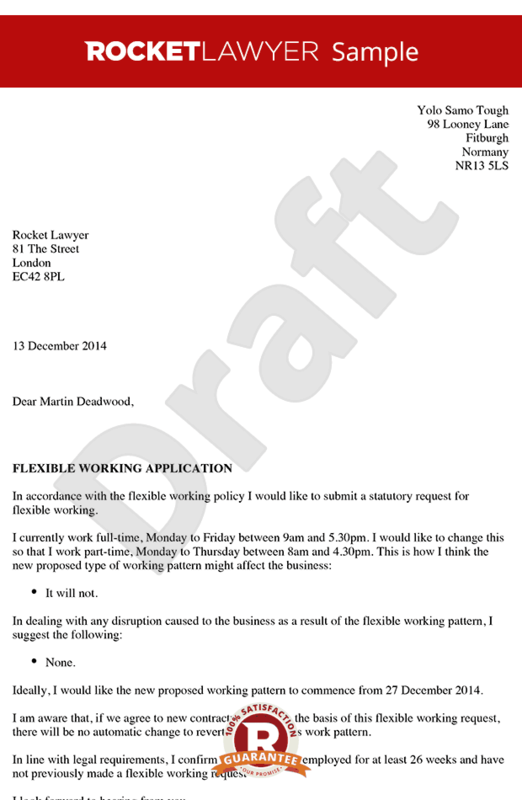 A flexible working application forms part of the formal process to request flexible working. It keeps a record of the proposed working arrangements and demonstrates the staff\'s eagerness to accommodate the business\' interests with a new working pattern. What are the eligibility criteria to request flexible working? What types of flexible working can be proposed in the request? working from a different place, eg working from home. What happens after applying for flexible working? The application for flexible working is usually followed by a meeting with the employer to discuss the proposed working arrangements. If the request is accepted, this will result in a permanent change to the employee\'s employment contract. What if the application for flexible working is rejected? The employer can reject the application for several reasons (eg if flexible working would affect the business performance, etc.). In any case, employees should be able to appeal the decision within 14 days from the rejection date. rejected an application based on incorrect facts. How long should it take for the employer to consider the flexible working request? The whole application process, from the initial request to the employer\'s final decision, should take no longer than three months (unless otherwise agreed by the employee). This flexible working application is governed by the law of England and Wales. \r\n" created_timestamp: "2018-10-08 04:37:02.0" modified_timestamp: "2018-10-08 04:37:02.0" active: true created_by: 104 modified_by: 104 dcm_id: 331 url_slug: "Flexible-working-request" meta_description: "Apply for flexible working with this flexible working application form. Set out your flexible working request with step-by-step guidance from Rocket Lawyer." time_to_complete: "10 minutes"
What's a flexible working request? A flexible working application forms part of the formal process to request flexible working. It keeps a record of the proposed working arrangements and demonstrates the staff's eagerness to accommodate the business' interests with a new working pattern. The application for flexible working is usually followed by a meeting with the employer to discuss the proposed working arrangements. If the request is accepted, this will result in a permanent change to the employee's employment contract. The whole application process, from the initial request to the employer's final decision, should take no longer than three months (unless otherwise agreed by the employee). More than just a Flexible working request template, our step-by-step interview and guidance makes it easy to create your document. Easily create online, download, print and sign your free Flexible working request in minutes. This document is also sometimes called: Flexible working application.